The privately owned stallion Goldfever by Grosso Z/Galvano is the Hanoverian Stallion of the Year 2010. The chestnut, who has particularly established a reputation as one of the most successful jumpers worldwide, was honoured at the stallion licensing in Verden. The president of the Hannoveraner Verband, Manfred Schaefer, and breeding manager Dr. Werner Schade, presented his breeder Sigurd Hochmuth, Meerbeck, with the valuable Wohlklang-statuette and a cheque. By donating this prize, the R+V/Vereinigte Tierversicherung annually honours an important Hanoverian stallion. 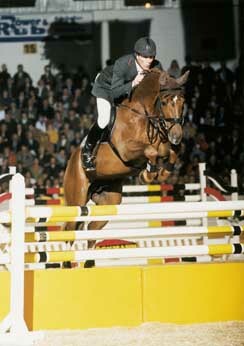 Goldfever developed into one of the most successful jumpers ever under his rider Ludger Beerbaum. He jumped to more than 2 million Euro in his career. He competed at the Olympic Games for Germany, became Olympic Team Champion in Sydney in 2000, in 2003 European Team Champion in Donaueschingen as well as second in the individual division. Goldfever was German Champion in 2000 and 2001. However, he failed to achieve the big individual titles. 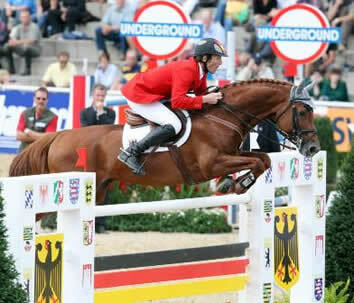 In 2009, he was retired from sport at the age of 18 in the Aachen Soers. Goldfever was born with Sigurd Hochmuth in Meerbeck in 1991. He is the most famous representative of the foundation stock of Jugendzelt, 1930, breeding site Enders, Groenloh. His granddam Dana already successfully competed in jumper classes with the breeder’s son. Goldfever was the first foal out of the mare Gundula who produced a lot of versatilely talented progeny. She was bred to different stallions, and her offspring achieved many successes in show jumping and dressage. Goldfever II, born in 2004, dominated at the stallion licensing with his above-average basic gaits, and he is successfully competing up to medium dressage level under Markus Gribbe. Today, two full sisters are standing in Sigurd Hochmuth’s stable. In 2002, the business man was honoured with the Golden Badge of the Lower Saxonian Ministry for Nutrition, Agriculture and Forestry. Uwe Buenger from Hemmingen raised Goldfever. He was one of the top jumpers at the stallion licensing in 1993 and sold at a high price. One year later, he completed his stallion performance test in Celle, ranking eighth with a final score of 121.45 points. Claudia Prohoffnik started to train him on the Wiechenhof near Hanover and introduced him into sport. The unforgotten Dieter Schulze discovered the stallion, purchased him and under his patronage, he competed with Dirk Ahlmann at the Bundeschampionate and at the World Breeding Show Jumping Championships for Young Horses. Goldfever already presented powerful and self-confident performances in his early years. His exemplary career with Ludger Beerbaum at international competitions all over the world started in 1998. Besides his sport career, Goldfever was also at breeders’ disposal for a short while. Only few breeders bred him to their mares, but he took his chance as stud stallion: 36 of his 74 foals are registered as competition horse with the German FN. Five of his offspring are successfully competing in advanced level jumper classes. His daughter Gotha (breeder: Jan Minners, Jork) is a top-notch jumper and at the age of nine Ludger Beerbaum’s most promising prospect for the future, and the two year elder Moosbachhofs Goldwing (breeder: Manfred Gerken, Oyten). The approved stallion participated with the Hungarian Sandor Szasz at the World Equestrian Games in Kentucky, ranking third in the first qualifier. Approved for: Hanoverian, Hanoverian Jumper Breeding Program, Oldenburg, Westphalian, Rheinlander.